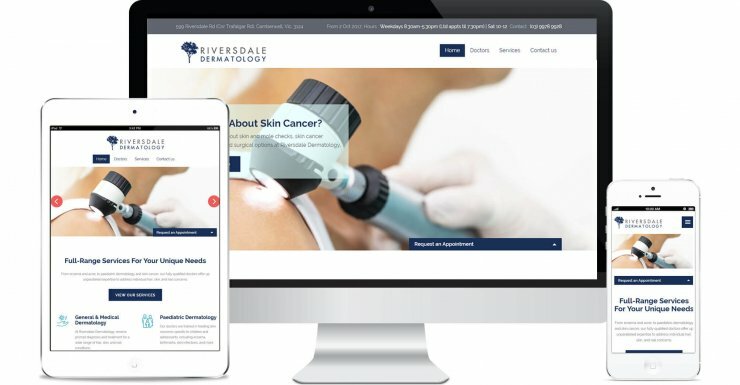 Riversdale Dermatology is a dermatology clinic based in Camberwell, offering up treatment for a range of hair, skin, and nail conditions for both adults and children. With the opening of the clinic a few months away, Vanessa and Matt Palmer approached us for the design of a new website, logo, as well stationery materials (business cards, letterheads, and email signatures). We first kicked off the process with the logo design, based on a gorgeous gumtree in their neighborhood. From there, we created their website that fit the logo, with a blue colour scheme, clean layout, and fitting web copy. Meant to showcase their services as well as offer up an easy way for patients to enquire for appointments, Riversdale’s new website has already received great feedback from Vanessa and Matt’s peers in the industry! Interested in a search-engine optimised, mobile-ready new website? Contact us today for a free consultation on our Web Design and Development and Digital Marketing services.